In the ongoing debate over U.S. health care reform, the universal coverage mantra has collided, inevitably, with the cost issue: How would a substantial expansion of health care coverage be financed? Some proponents of a single-payer (government) system of health insurance have responded: Not to worry. "Administrative costs" are so much higher for private insurance than for such systems as Medicare that a shift to a single-payer system would yield savings sufficient to provide coverage for all of the uninsured. Indeed, government data show that the net cost of private health insurance plans is about 11% to 14% of total premiums paid, while direct administrative costs reported in the Medicare budget are about 3% of Medicare outlays. But not so fast: Government budget data show that the indirect administrative costs of Medicare are about as large as the direct costs. Those data also fail to account for the economic distortions created by the tax system, simultaneously substantial, difficult to measure and universally ignored. New research from the Manhattan Institute shows, first, that under a full accounting, the argument that savings in administrative costs would be sufficient to cover the uninsured is highly problematic at best. Second, the distortions created by the tax system make the true economic cost of delivering health insurance benefits under a single-payer system at least double those of private insurance. Medicare receives services not shown in its budget from other parts of the federal government. A proportional allocation of those costs raises the Medicare administrative ratio to about 6% of Medicare outlays, or double the proportion commonly asserted, although still only about half the net cost of private insurance. Would that difference in administrative costs be sufficient to cover the uninsured? 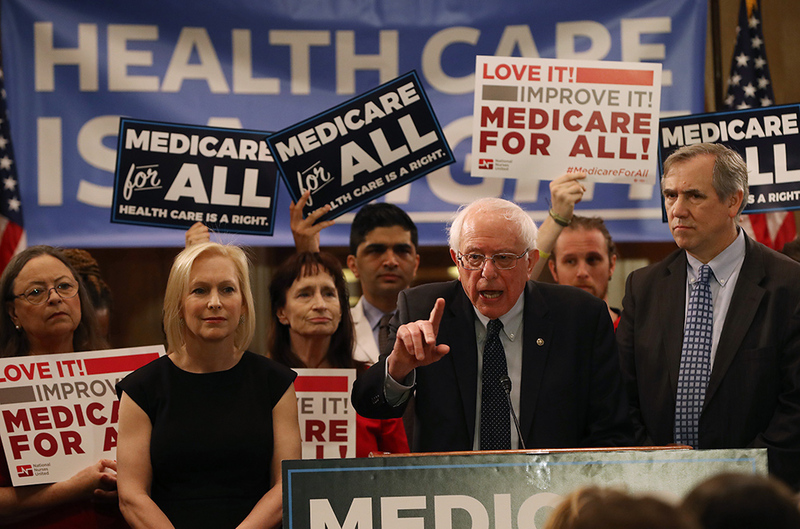 A shift to a single-payer system for all Americans would yield net savings in reported administrative costs of about $100 billion annually, or $2,100 in additional health care benefits for each of the 47 million individuals estimated as uninsured. The academic literature suggests that the average increase in health care consumption by the uninsured would be in the range of about $1,700-$3,400. So the annual change in total health care spending would range from a funding surplus of $19 billion to a funding shortfall of $61 billion; the midpoint is a $21 billion shortfall. This estimate is likely to be too optimistic because not all of the current health care consumption by the uninsured is funded by the public sector, and because these estimates assume away increases in the prices of medical goods and services attendant upon a doubling of the population eligible for a Medicare-type program. This "excess burden" of the tax system is a real economic cost of federal spending, yielding GDP lower than otherwise would be the case. It is analogous, therefore, to the economic cost of pollutants emitted by factories. Based upon the academic literature, a barely plausible lowest estimate of that excess burden is 20%, which raises the true cost of delivering Medicare benefits to about 24% to 25% of (tax-financed) Medicare outlays, about double the net cost of private health insurance. Moreover, private administrative costs are not "waste," and cannot be eliminated without adverse effects. Marketing â€” the bugaboo of many â€” provides consumers with information about the availability of competing insurance products; one size really does not fit all. Through the creation of brand-name capital, it provides powerful incentives for insurers to honor their promises to policyholders. Underwriting â€” the allocation of premiums in accordance with risks â€” reduces the scope of cross-subsidies among groups of policyholders. Such cross-subsidies drive lower-risk groups out of the market, meaning that too little insurance (or risk-pooling) would be purchased, too much self-insurance would be observed, and the allocation of risk would be inefficient for the economy as a whole. Efforts by private insurers to scrutinize claims ensure that services for which coverage is claimed actually are included in insurance policies, and that prices demanded by providers are within the limits specified in contracts, thus conserving resources and reducing premiums. In a world in which resources are limited always and everywhere, single-payer "coverage" cannot guarantee health care, and "universal coverage" is a mirage. Governments subjected to clashing budget pressures have powerful incentives to impose price controls both explicit and hidden, by squeezing payments to medical providers, by denying certain services to subsets of the population, and by imposing such hidden costs as waiting lists and underinvestment in medical technologies. Thus do the incentives inherent in the public sector lead inexorably to the all-too-familiar long-run degradation of health care quality observed under universal single-payer systems. That is why "universal coverage" is the opposite of health care. The Manhattan Institute study reminds us yet again that all free lunches are based upon false accounting: The purported single-payer "savings" in administrative costs are illusory, and cannot be separated from the larger adverse effects inevitable in a system in which government policy is driven by interest groups rather than patients. Such are the fruits of government compassion. HSA Health-Insurance Plans After Four Years: What Have We Learned?